lights flickering and dimming in house Archives - Lammon Electric LLC. There are times that flickering lights can be decorative and fun, like flicker flame chandelier lights, but in many cases, it isn’t something that is wanted. 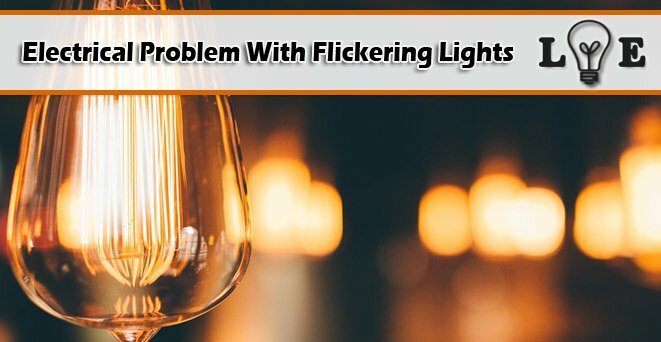 While flickering isn’t something to be worried about, it is always best to make sure that it isn’t a part of a bigger problem. Below are some reasons that your light bulbs flicker and dim and which ones you should be worried over. See below for a list of reasons your lights flicker and what you need to do about it. There are certain light technology types that are more prone to flicker than others. For instance, flickering can happen in fluorescent lights during the beginning few minutes or so after it is turned on when the phosphors hit their illumination peak, or whenever the bulbs have failing ballasts. It is very possible for any LED light to begin flickering whenever they are not connected properly to a dimming system or driver. Neither of these indicate a big electrical problem, but you may want to replace the lights if the flickering becomes to annoying. A simple reason that your bulb may be flickering is because it was screwed in loosely into a socket. For most lights it could seem like a no brainer to check this, but for a recessed light or other types of fixtures where the bulb is exposed, it may come less to your mind. Before you check for this, you want to make sure that you turn the light off and put on a heavy-duty glove before you grab and tighten the bulb as it may be hot, especially if it has been on for a few minutes. If your bulb keeps flickering once you have done this, then your problem is somewhere else. Another reason that the light may be flickering is because of the light switch not being properly connected to the bulb. Try to flip the switch off and on or shut the light off for a few minutes and then turn it back on. If the problem is fixed, then you found the issue. If you constantly have to do this to keep your light from flickering, then it is best to replace the light switch. If you have been noticing more flickering than your used to when there hasn’t been a change to the electrical system, this could be a sign of a major electrical issue. For instance, whenever a circuit connection becomes too loose, it will create a high resistance point. This is a very dangerous problem that a flickering light could mean because of the high resistance point means heating up. Another major problem could show up is switch failing. This is dangerous too, but the danger is just in the switch, unlike a loose circuit which can damage the whole system. If your lights are flickering when you turn something on that uses high wattage, the reason could be due to the voltage in your house fluctuating too much. If the flickering happens longer then when using the appliance, then there could be a major electrical problem. Other types of signs of voltage in your home isn’t right will include the lights dimming unexpectedly and burn out a lot. Electricity will normally flow into the house at 120 volts. Even though a bit of fluctuation is normal, your home needs to be supplied with between 115 volts and 125 volts. You can check your homes voltage by using a voltmeter. If the readings are in the right range, then you have found the cause of the light issues. There are some cases that call for use of a 130-volt bulb which can handle the high voltage. But it is best to check with an electrician. Loose wiring is a very major cause for a flickering light and a big reason for a house fire. Shut the light off at your circuit breaker before you remove the fixture and check the wiring of the fixture. If you have noticed that the wiring is not secured or loose call your electrician. After all of this, if you cannot locate a reason for any flickering light, then call a professional to check your homes wiring to be safe. There are times that an appliance has bearing failure, which causes the motor to work much harder during start up which draws more current and causes light flickering. Flickering can also happen when the load is activated unexpectedly. For instance, a sump pump could cause flickering or dimming when properly circuited. The electrical load at your neighbor’s house can also impact your lights. In some cases, it is likely that you share a transformer with multiple neighbors and because of that their loads will impact your electrical supply. If the flickering is really noticeable or it has changed unexpectedly, you need to investigate. Some looking around is easy and safe to do on your own. You can just try to find if it flickers with certain appliances being turned on by listening for buzzing or cracking sounds at the breaker when a load is activated. This could allow you to troubleshoot the appliance or circuit cause the flickering. However, if you get annoyed by the issue or believe its getting worse contact an electrician. A professional can measure the voltage drop you have when different loads turn on. Once you know where the flicker is coming from, then you can make the choice if it needs to be fixed and if an electrician needs to do it. Just know that the circuit breaker basics before you make any changes to your system. It isn’t a great idea to ignore an electrical or lighting problem. If you notice lights flickering, check it out and if you can’t find the cause or it keeps happening, call an electrician. Lammon Electric offers licensed electrical services in Albany, Troy and Delmar, NY. Give us a call to fix your flickering lights today! Do you have flickering lights that could be caused by something other than what is listed here? Leave a comment and list it below. Posted on April 27, 2018 June 25, 2018 Author greglammonCategories Electrical ProblemsTags light flickers when turned off, lights flickering and dimming in house, lights flickering in house fire hazard, lights flickering in whole house, lights flickering on one circuit, what causes lights to flicker and dim?